I keep seeing rolled paper everywhere: jewelry beads, adorning picture frames, edging mirrors. So inspiring. Surely one could use that stack of magazines gathering dust in the corner and come up with something sorta fun, no? if you want words, by all means LET THE WORDS BE SEEN. 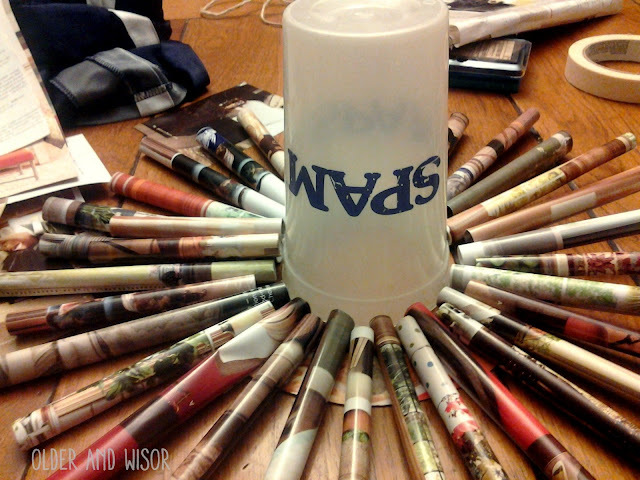 Pull a cereal box from the recycle bin, and cut a circle. 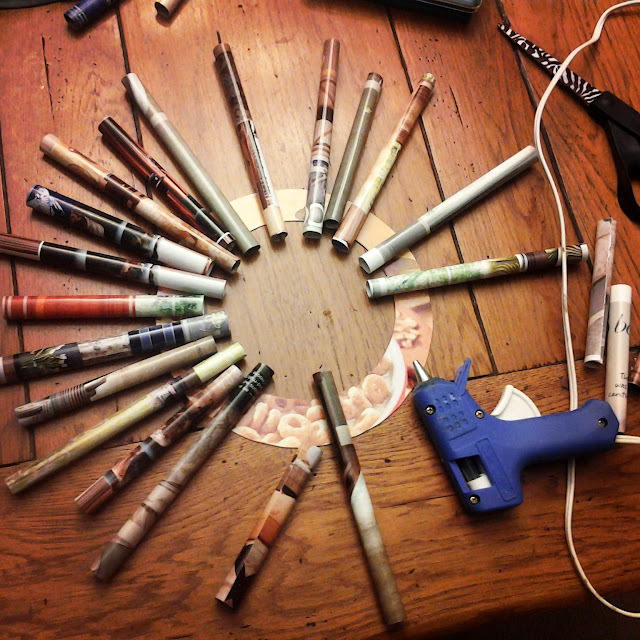 Using a pencil as your guide, roll each (cut in half) page into a tube, then secure with a line of hot glue. You can lay it out however you want. I pretended it was a clock and put a 3, 6, 9 and 12, filling in between those spots. A cup (or measuring/paying more attention/being more precise) keeps things even-ish. 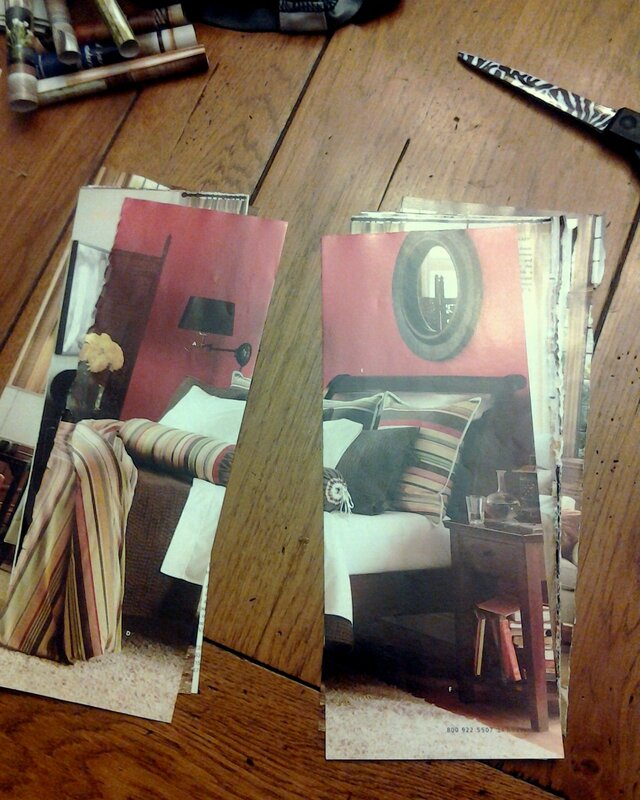 If things are a little catty wonk in the end, some snipping with scissors will fix it. A piece of twine glued in a loop to the back is the "hanger". I thought perhaps it would be too delicate for the constant opening and closing of the front door by five children and their friends, but it's been over a month and no sign of distress yet. Not too shabby for free. Linking up over at Jen's place. Cute idea. Free is always good. Doing this in miniature could make a cute Christmas ornament. Ohhhhh, you could use left over pieces of wrapping paper. Oh or any kind of wrapping or paper to make one to decorate a gift. See, now you got me thinking! TFS! I wonder where you got your practice rolling? You're very good at it. This is so cool! I am a huge fan of using items I already have, so this was right up my alley! Hope you have a wonderful weekend! 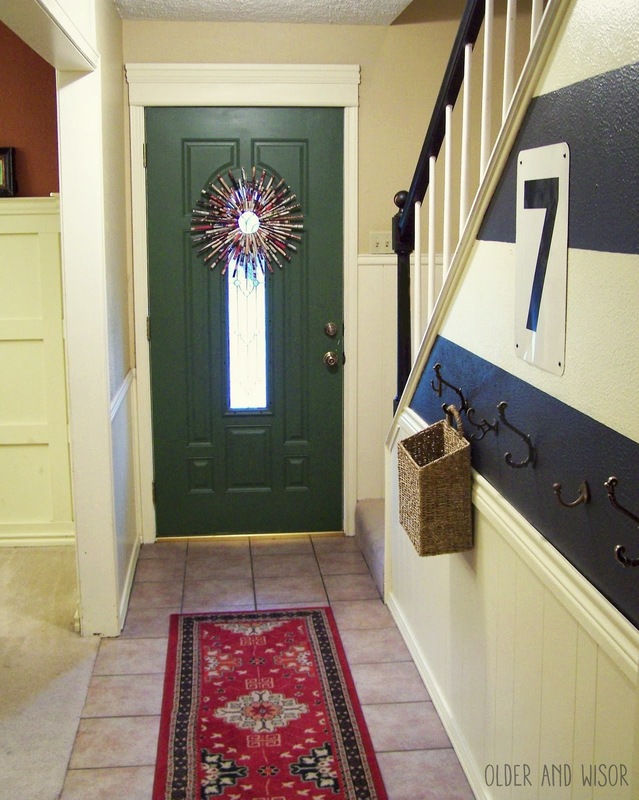 That's really cool and it looks great on your front door! Love the wreath! There are so many options to create your own wreath ...spray painting it in a trendy color, change the size bigger or smaller, use book pages or construction paper - maybe even newspaper??? Free is also my favorite. Very nice. I am also admiring the black handrail on your staircase. Tell me you had a quick n easy way to tape off EVERY SINGLE SPINDLE?? That's my biggest hurdle in painting my own hideous honey stained oak stair rail. 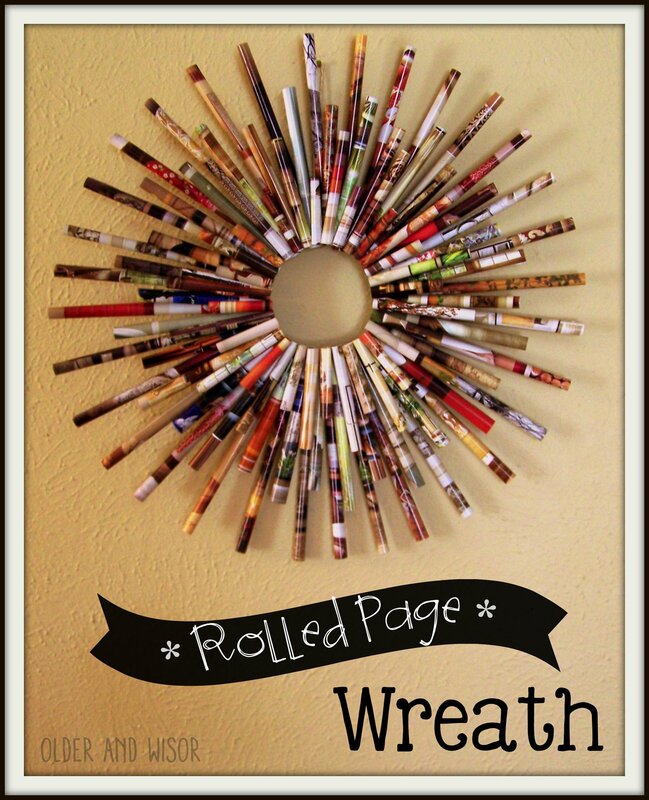 at first, i think- why would i want a wreath made out of magazines rolled up? and then i see it on your green door and change my mind. and then i think that you and i should do a crafting show where you make crafts and i ask questions like, "why the craft would i want that?" and then you we both look at the camera for a really long time.